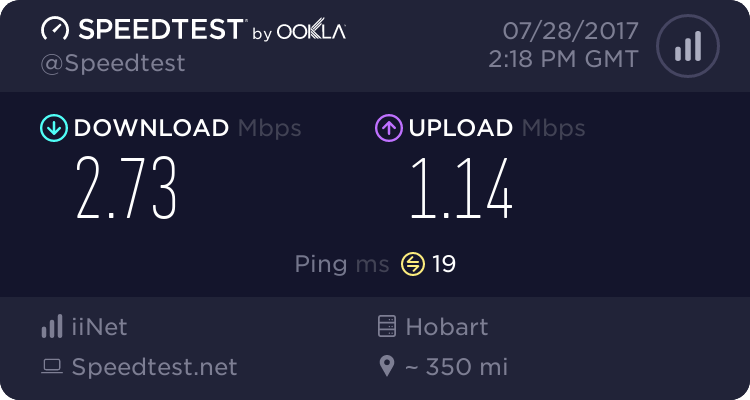 It’s getting close to the fourth anniversary of our NBN fixed wireless connection. Over that time, speaking as someone who works from home, it’s been generally quite good. 22-24 Mbps down and 4-4.5 Mbps up is very nice. That said, there have been a few problems along the way, and more recently evenings have become significantly irritating. There were some initial teething problems, and at least three or four occasions where someone was performing “upgrades” during business hours over the course of several consecutive days. These upgrade periods wouldn’t have affected people who are away at work or school or whatever during the day, as by the time they got home, the connection would have been back up. But for me, I had to either tether my mobile phone to my laptop, or go down to a cafe or friend’s place to get connectivity. There’s also the icing problem, which occurs a couple of times a year when snow falls below 200-300 metres for a few days. No internet, and also no mobile phone. These are all relatively isolated incidents though. What’s been happening more recently is our connection speed in the evenings has gone to hell. I don’t tend to do streaming video, and my syncing several GB of software mirrors happens automatically in the wee hours while I’m asleep, so my subjective impression for some time has just been that “things were kinda slower during the evenings” (web browsing, pushing/pulling from already cloned git repos, etc.). I vented about this on Twitter in mid-June but didn’t take any further action at the time. Several weeks later, on the evening of July 28, I needed to update and rebuild a Ceph package for openSUSE and SLES. The specifics aren’t terribly relevant to this post, but the process (which is reasonably automated) involves running something like `git clone git@github.com:SUSE/ceph.git && cd ceph && git submodule update --init --recursive`, which in turn downloads a few GB of data. I’ve done this several times in the past, and it usually takes an hour, or maybe a bit more. So you start it up, then go make a meal, come back and you’re done. Not so on that Friday evening. It took six hours. 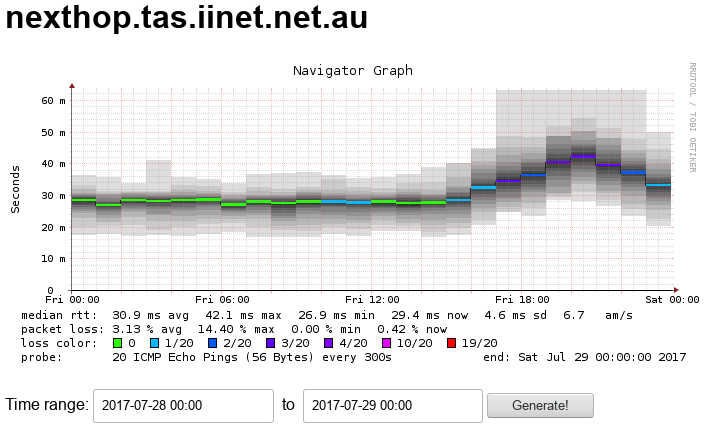 So I’ve finally opened a support ticket with iiNet. We’ll see what they say. 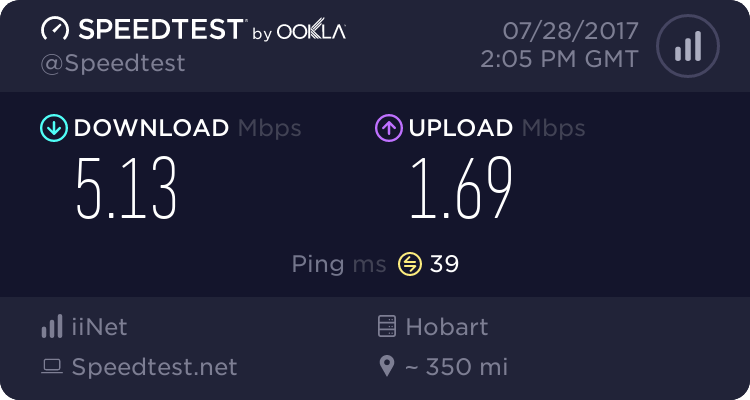 It seems unlikely that this is a problem with my equipment, as my neighbour on the same wireless tower has also had noticeable speed problems for at least the last couple of months. 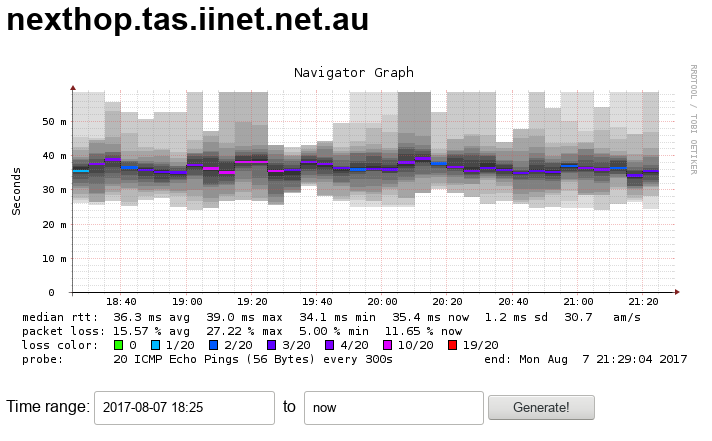 I’m guessing it’s either not enough backhaul, or the local NBN wireless tower is underprovisioned (or oversubscribed). I’m leaning towards the latter, as in recent times the signal strength indicators on the NTD flick between two amber and three green lights in the evenings, whereas during the day it’s three green lights all the time.